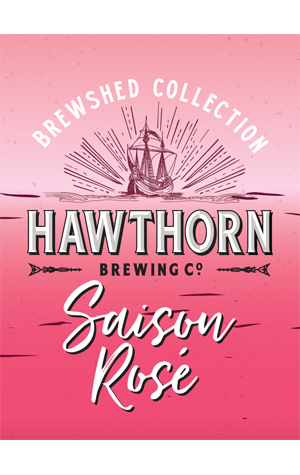 Hawthorn Brewing's Brewshed Collection is the space in which they step outside the line and length confines in which they built their name with their core range beers. And for their spring 2017 release, they've stepped outside the beer world and into a winery in South Australia. There, they helped themselves to some Not Your Grandma's Rosé, a blend of grenache and mourvedre from old vines in the Barossa and riesling, gewurtztraminer and Weißer Herold from the Eden Valley. Why? Apparently, this time last year they drank a fair amount of rosé and decided to combine it with one of their favourite beer styles, dry saisons. It started out as a Belgian style farmhouse beer fermented with a saison yeast and left unfiltered. They say to look out for a "complex fruit palate with influences from Old World hops, yeast esters and a unique addition of rosé wine."